Once the wine reduces by half, add the pasta water, cream, dill, lemon zest and the rest of the lemon juice and half the cheese. Add the pasta and let cook all together, when all is thick and nicely hot, add the shrimp back in. 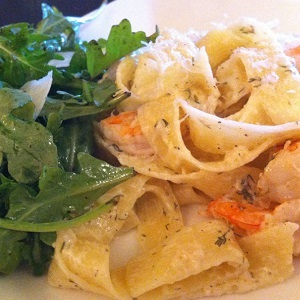 To serve top with the rest of the parmesan cheese and accompany with Arugula Lemon Salad.